We can’t wait to see you at Zoomtopia this week! This year’s theme is Under the Sea – here are all the tidbits to make sure you are fully equipped with knowledge swimming into Zoomtopia. Below we’ve detailed information about parking, registration, our mobile app, the agenda, and the epic party in your very near future. Once you arrive to the conference, walk to the Lobby of Hall 3 to pick up your badge. We recommend wearing your event badge at all times during Zoomtopia – well, maybe take it off when you sleep. Registration opens at 11:30 am on October 10th and at 7:00 am on October 11th. Next, the fun begins – join us at Expo to enjoy food and drinks while networking, checking out our partner booths, and visiting the four state-of-the-art Zoom Rooms we’ve installed. Make sure you have the Zoomtopia App downloaded on your phone – our conference has a lot to offer and the app will make sure you enjoy Zoomtopia to the fullest. The app allows you to explore all the sessions, connect with your fellow attendees, and create your personal schedule. 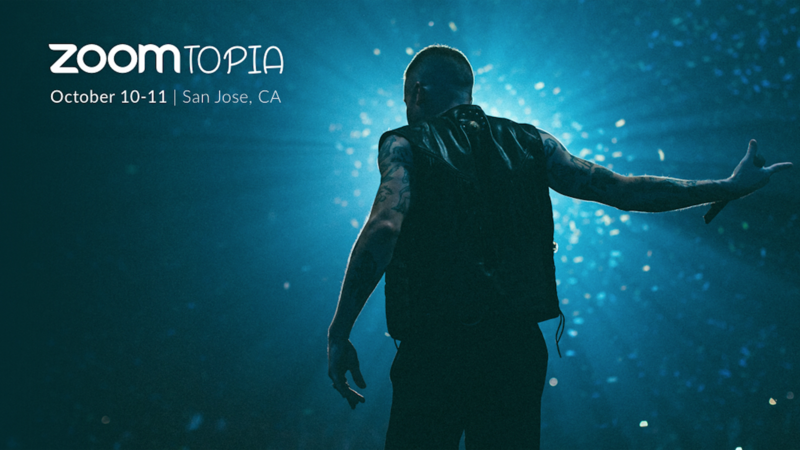 Join us for amazing keynotes, informative breakout sessions, swag, games, and, finally, a performance by Grammy Award-winning artist, Macklemore on Thursday night. We are excited to see you there. If you still aren’t registered, it’s not too late to join us!